Should I repot this Dracaena Marginata plant? Someone bought me a dracaena marginata for Xmas, and I'm happy with it, but need some help since I've never owned a houseplant before. I was going to repot so I took the plant out of its plastic container. I was surprised at how little soil there was in the pot. Here are a few... show more Someone bought me a dracaena marginata for Xmas, and I'm happy with it, but need some help since I've never owned a houseplant before. But then I read that plants should not be repotted in winter, nor should they be repotted within two weeks of purchasing them (to adapt to its new environment). So should I repot now or wait? The current plastic pot fits well into a 8.5" pot. Should I move up a pot size? Also the plant tips have been browning, but I think it might be because of humidity deficiency..
Best Answer: Why on earth do you want to repot this Draceana Marginata or Dragon Plant when you have only just received it? Do NOT pot it on until it is completely pot bound which will be in 2-3 years time as it grows very slowly, and then you only repot to one size bigger pot to give it fresh soil as much as anything else. It likes being pot bound. If you don't like the plastic pot it is currently in put the plastic pot inside the container you do like it in. Draceana is an easy house plant to grow and will thrive on neglect. It doesn't like being overwatered or it will get root rot so the soil needs to be kept on the dry side. It doesn't like bright sun and will tolerate low light levels in average room temperatures. Brown spots mean too much light. The brown tips on the leaves could be down to low humidity especially as it is winter and we have heating on, so give it the occasional misting. It doesn't like fluoride so if your water is heavily flourided it's best to use rain or bottled water rather than tap. Now put it in position and enjoy. If it gets too big chop the top off and it will resprout. You can also grow another one from the bit you chopped off or from the roots. That plant has typical root growth and is not pot bound. 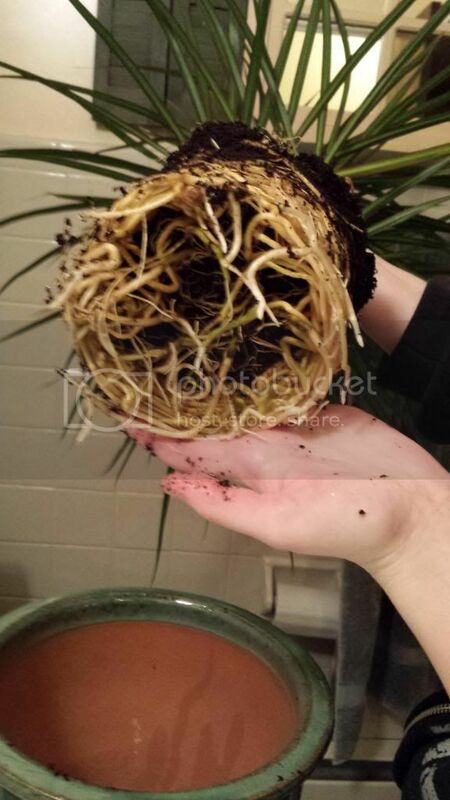 When it gets to be pot bound the roots will start to curl around in a circle and there will be no visible soil the plant roots are very fresh and new. The plant looks great. You can repot now if it suits you or you can wait six months. It will not make a real difference to the plant. If you decide to repot now be sure to add some new potting soil to the pot. No commercial grower would take time to spread the roots he would just put it in a larger pot with fresh soil below and on the sides. I have never heard of waiting two weeks before replanting. The new ceramic pot will help show off the plant. Avalon is correct in that the plant is very sow growing. If you put it in the ceramic pot make sure that there are drainage holes. I had to thumbs up george here. What Y C said wouldn't be harmful to the plant, using care not to pot up more than a size or two. Often folks starting out want to buy a real big pot (over potting). Then they water to much but, back to your plant it's looking fine. If you live south of zone 8, I would bump it up come Marc . If you live north of 8 at the growing season. The additional insulation of new soil may help give the roots an early start during cooler nights. Air layering IS the best and easiest method of obtaining new tropical plants by asexual reproduction. It was invented by the Chinese and works very easily, is simple to do, and is perfect for tropical indoor plants. What's this BS about not having enough time? Air layering might take six months. Rooting cuttings will take several weeks. And if the stem cutting fails, then you've really wasted your time. With Air Layering the original plant will regrow if the Air layers are at appropriate locations. The Chinese invented the practice. They cut clay pots in two, then reunited them around a plant stem and filled it with dirt. I've found the original Chinese method is actually as good or better than modern methods with plastics. Why? Clay pots "breathe".... Let it alone for three-six months and voila, it roots and you can separate the new plant. With clear plastic you can see the roots. With opaque plastics, you can squeeze lightly and should be able to feel the roots. For tropicals, if you want to try stem cuttings, I recommend baked river sand [not ocean sand which has salt] alone and it should work fine, or you can use Vermiculite half and half with Perlite, but those two are rather expensive! Most people loose cuttings due to rot from excess moisture allowing fungal attacks. That's why traditional sand works well, it drains well. You bake it in an oven to kill harmful organisms. However, moder methods can speed up the process significantly. Here's a great method to use. Take a suitable branch or stem you want to air layer. Mix in a bowl shagnum moss with sand and potting soil about 1/2 moss and 1/2 sand and potting soil. You can sterilize the sand and soil by baking it in an oven for 30 minutes or so if you like, or treat the stem with a commerical fungicide or both. Now tape clear plastic at the lower junction of the stem after you've scraped the stem with a knife. Some gardeners recommend slicing the bark around the stem entirely. I find that it works best to rough the bark with a knife or rough sand paper until you reach the cambium layer and then treat with Rootone rooting compound!! !, fill with the moss sand mix--some gardeners use just the moss alone. I've tried peat moss instead of sphagnum solo and it works rather well indeed! The clear plastic allows you to visually SEE the roots which should appear in a couple months, six at the latest. Tape the ball of moss in a ball around the wounded area and try your best to create a hermetic seal with the plastic. Now you can do other things and let Nature do the rest for you. Once you see roots, cut beneath the layered area and pot the plant in a separate container and baby it awhile until it is doing well. Layering, stooling, dropping and other similar methods are a slow, but very SURE method of getting results. There are tropical plants that can root in plain water like English Ivy. You might want to take a few small tip cuttings and place them in water. If this works, you can easily make a dozen plants in half no time. Once baby roots begin to appear, wait until they are sizeable enough and carefully pot them and allow them to mature. By the use of Hydroponics techniques which I use, and root cuttings in a aqueous gel solution, I can root just about anything I like without expensive misters and all that blahblah. That plant is very pot-bound and needs a much bigger container. Tease the roots apart before re-planting. I nearly always re-pot my plants straight after buying as the pots are often pretty naff and have had no problems with it.You are correct about the brown tips, it may have been very badly treated in the shop. 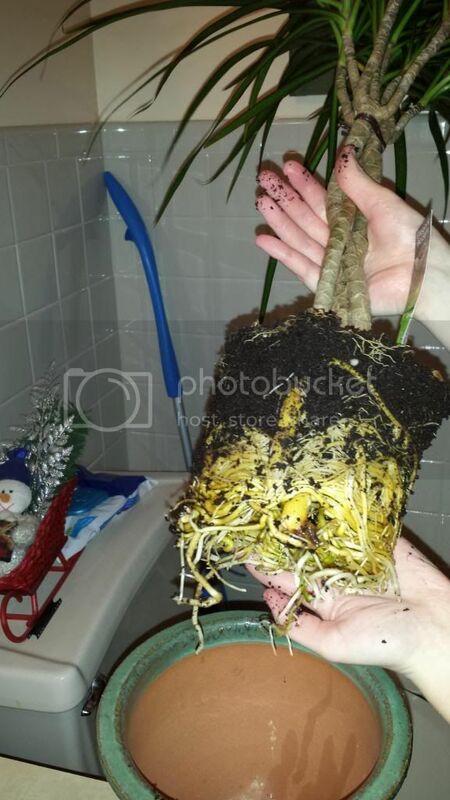 I just got a plant I believe to be a dragon tree( either dracaena deremensis, or dracaena marginata)? What is easier to care for a Dracaena "corn plant" or Dracaena marginata or a Areca Palm? Dragon tree (Dracaena marginata) help? How do I care for my dracaena marginata outdoors?